“3, 2, 1, GO!! !” After a quick launch and a short shift into second gear we are into the slightly curved slalom and then braking hard for the 180 degree turn. By now driving the car in the layout of the course has become second nature and the focus is to push the tires to their limit and hope for a blistering lap time. 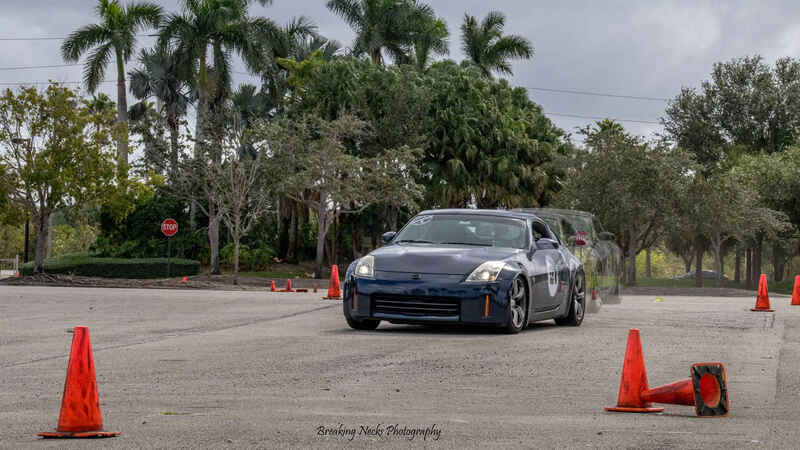 Things happens very fast in Autocross and everything from your driving ability to your car’s setup will be put to the test when you’re out there. So what is “Autocross” (Autox for short)? For those of you who aren’t familiar with the sport, its basically a low speed mini race course in a large tarmac surface signaled with traffic cones and other low risk barriers. The goal is to drive your car as fast as you can for the quickest time possible in 1 lap, the person with the fastest time wins. In a nutshell, it’s one of the best ways for anyone to get their feet wet in the auto racing world with relatively very low risk to the car or to themselves. It’s a good way to learn car control, braking and proper acceleration while having a blast. There are different ways you can join the fun, there are a few organizations that host Autox or Solo events. Some of them are SCCA, (Sports Car Club of America) PCA, Equipe Rapide Sports Car Club, NASA and a few other local ones. Usually they allow any type of vehicle to participate in events, I’ve seen a 90’s Astro van doing Autox before, as long as the car passes tech inspections they will let you run it. Now if you’re looking to be competitive and believe me, people get ridiculously competitive at these events, you will want to upgrade your car according to the regulations your class or spec dictates. To keep things fair these organizations will mandate what tires you can run for different classes and what modifications can be done to the cars. Some cars have a natural advantage in Autox, Miatas and other small chassis cars tend to be very nimble and corner and brake really well. Almost any car can be built to perform well in Autocross, tires and suspension upgrades a must for anyone looking to get competitive. Engine performance upgrades will help depending on the car you’re driving but because Autox is mostly demanding on the handling aspect of the vehicle, engine power does not win races as much as a balanced suspension and sticky tires do. We upgraded our 350z to handle well by installing a custom valved racing coilover kit with polyurethane bushings in the differential mounts. We are currently still driving on the stock VLSD (viscous limited slip differential) but we plan to upgrade it with a Tomei 1.5 way LSD in the near future so we can have a more consistent power delivery to both rear wheels when we need it. We are also currently racing with the Bridgestone Potenza s-04 tires which admittedly aren’t wide enough to keep the Z as tight on turns as we would like, a new wheel/tire combo upgrade is also coming soon. All-in-all Autocross is a cheap and safe way to drive fast and learn new skills. Its plenty of fun for people on all skill levels and pretty much all cars. Join us at the next event and experience it for yourselves! Here are the links to the performance auto parts and the racing organizations that I have mentioned above.